the suspension in to their liking. 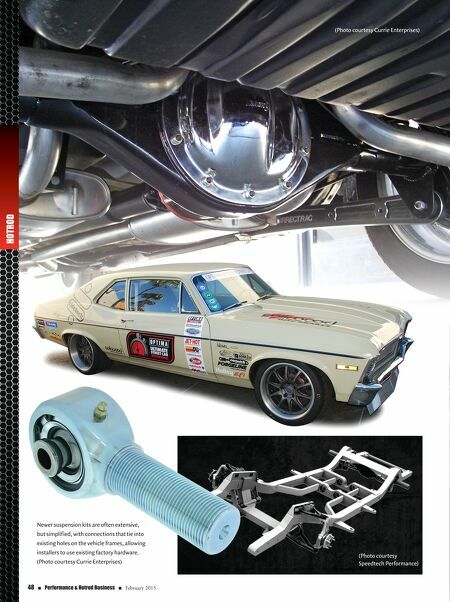 They can drastically improve the performance and ride of their vehicle with simple bolt-in components." Dave Schlossberg, president/CEO of Poly Performance & Synergy Mfg., reminds shops to not forget the off- road market when seeking suspension customers. "Anything new is doing well. In our space, Jeep Wrangler products (specifically 2007-newer) do very well." With the evolution of suspensions come new materials. Brian Shephard, marketing director of Currie Enterprises, points out a few. "Chromoly has always been a staple, but it has become a lot more mainstay in the last few years," he says. "It offers strength and a sales bullet point. We've been CNC- ing a lot more billet aluminum suspension components as well. They always start out on our own vehicles as high prototypes and evolve into production components after we have tested the market with them." The Market Changes That brings to mind the speed at which changes pour out of suspension manufac- turers. Just how fast are these new parts coming out? Kass says that QA1 has been seeing a rapidly grow- ing change in the demand for certain makes and models, and the speed at which the popularity grows. "All of us manufac- turers are trying to pre- dict the next growth trend to be ahead of the curve. I feel the number of products offered for a given vehicle can influence whether or not someone may purchase that vehi- cle with the intent on modifying it. 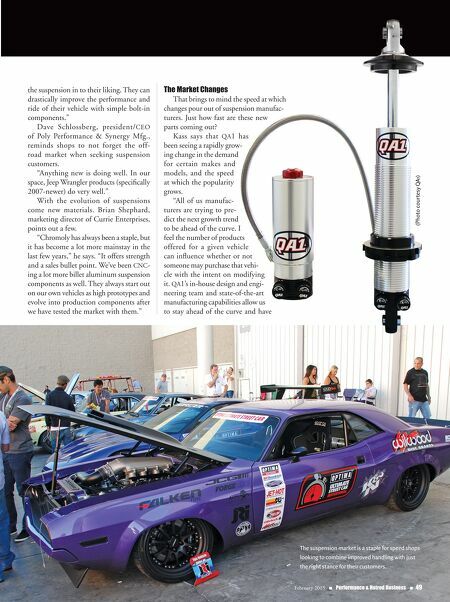 QA1's in-house design and engi- neering team and state-of-the-art manufacturing capabilities allow us to stay ahead of the curve and have February 2015 n Performance & Hotrod Business n 49 (Photo courtesy QA1) The suspension market is a staple for speed shops looking to combine improved handling with just the right stance for their customers.